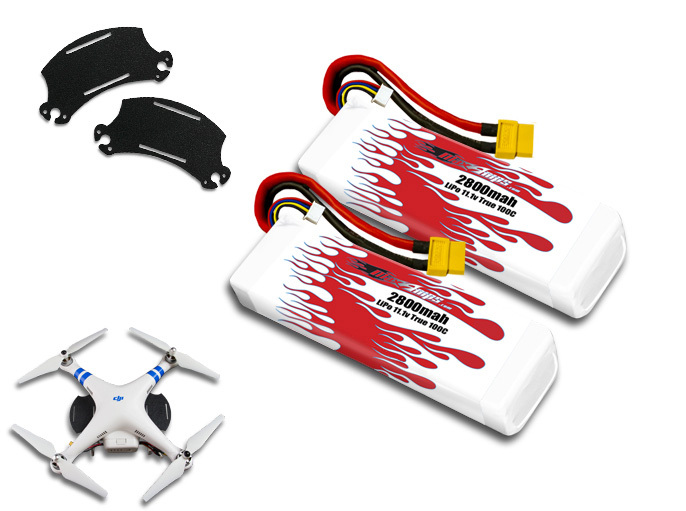 This upgrade for the DJI Phantom and Phantom FC40 Quadcopter will maximize your power and flight time. Be sure to add the XT60 Parallel Adapter and Dual Battery Tray Expansion Kit from the drop-down menus on this product if you don't already own them. These are required to fly this dual battery setup. By using these packs in parallel, you will be running a 5600 11.1v setup. This will more than double your flight time. Do NOT run these packs in series when using them in the DJI Phantom or you will damage your system. They are only to be run in parallel which doubles the capacity instead of the voltage. Note: This pack is built with the stock plugs shown in the picture for easy plug and play. If you need a different plug or balancing tap, please mention it in the notes section when checking out. Note: This battery pair is designed to work with the Phantom 1 and Phantom FC40 but can be used for the Phantom 2 series if you are running our unlocked cap system.